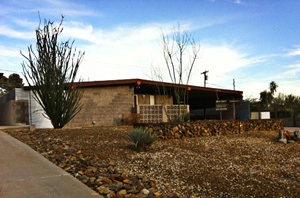 The Crouton P. Residence on 9817 N. Central Ave., most likely designed by Ralph Haver, AIA, in 1964. Photo courtesy of Aaron Kimberlin and Alison King. Held at a variety of locations throughout metropolitan Phoenix last week, the 2011 edition of Modern Phoenix Week offered exciting opportunities to attend a range of free presentations and see inside some rare and remarkable homes within the Sunnyslope neighborhood of north-central Phoenix. I was proud to be involved in Saturday’s Modern Phoenix Expo — offering a signed, framed print as a door prize there — and displaying my paintings within one of the 12 homes on Sunday’s home tour — the midcentury modern Crouton P. Residence at 9817 N. Central Ave., shown at right. Here I would like to share with you photos of my paintings on display at the aforementioned residence, which was in all likelihood was designed by legendary architect Ralph Haver, AIA. I am proud to say that I’m a part of this year’s Modern Phoenix Week in two fabulous ways. First, I will be exhibiting several of my paintings in a Ralph Haver-designed residence on Central Ave. in Phoenix, as part of the upcoming Secrets of Sunnyslope home tour. The April 17 tour — which is sold out — offers a chance to see some of the Sunnyslope neighborhood’s finest midcentury and modern dwellings.